Hello traveler, welcome to Loreseekers! Your hosts Jibbs and Kash are in their favorite Tamriel tavern, ready to take you through the wonderful adventures of the Elder Scrolls Online! The life that a Necromancer is far from the norm. You're regarded as evil, hated for what you practice and stand for. You are the anomaly. On this episode of Side Quests Jibbs dives into the life of a Necromancer and what you can expect when you play them in Elder Scrolls Online's Elsweyr. LS Vol. 3 #19: Who is M'aiq? We're back with another episode of Loreseekers! This week we catch up as we continue to wait on Elsweyr, detail a new mini series that's now available on our feed, talk the latest news with future experiences in Elsweyr, debut a BRAND NEW segment and take a shot of Lore with a new Lore Lesson on M'aiq! Enjoy the show and thank you for listening! Welcome traveler! I bet you didn't expect to see this today! Welcome to Side Quests. The mini series (maybe - it's in your hands) where Jibbs takes you through Elder Scrolls lore from his perspective while he's on the go. In today's episode we take a hard look at Seyda Neen and why its so much more than just your average village. Welome back travelers! This week on Loreseekers we do a complete roundup of the info dropped and things shown at Bethesda Game Days last week, dive into all Necromancer skills/morphs, talk April's Crown Store Showcase and ESO 5-year event and complete a Lore Lesson on Witches, Hagravens and Covens. Buckle up, its a long one! WE'RE BACK! This week on Loreseekers we celebrate 25 years of Elder Scrolls! Learn how you can pre-order your own Wrathstone Tablet, Elder Scrolls mug, T-shirt, lithograph and more! We also talk ESO free play details, get ESO for cheap during its sale, talk our first impressions of the Prologue quest for Elsweyr, complete a Lore Lesson on the schools of magic and answer your fan mail with the mail courier! Prop up your feet, order a drink and enjoy the show! The flu is gone!!! WE ARE BACK! This week on Loreseekers we catch up on all the news we missed the last couple of weeks, talk Bethesda Game Days in Boston, go over the remaining items from the Crown Store Showcase, enjoy new details for this year's Jester Festival and complete a Lore Lesson on the Undaunted! Prop up your feet, grab a drink and enjoy the show! Hello friends, as you might have noticed this is not a normal episode for us. Jibbs has caught the Knahaten Flu! With Jibbs under the weather it was going to be too difficult to put together an entire show, but we wanted to make sure and give you content. So we decided upon doing a LIVE Lore Lesson from our Twitch stream! Enjoy this Lore Lesson on the Five Year War. For the past two volumes we've placed an original Loreseeker storyline set in the universe of Elder Scrolls Online at the end of every episode. And now, culminating over four hours of content, we've taken all the stories and placed them in a single location. Right here. We hope you enjoy our first audiobook, Loreseekers: Origins of the Reliquary. Hello Seekers and welcome back to another episode of Loreseekers! On this week's episode we celebrate one year of Loreseekers with a very special announcement, give our first impressions of Wrathstone which covers: Guild Trader UI, new dungeon sets, Frostvault, Malatar, race changes and more. We also complete a Lore Lesson on Wrathstone's DLC dungeon/zone lore. Buckle up and enjoy the show! The tavern is open! Grab an Ale! It's time for a new episode of Loreseekers! This week on the show we review the Elder Scrolls: Official Cookbook, talk next week's Loreseeker Anniversary stream, go over new details from ESO Live and polish it all off with a cold glass of Sheogorath in a new Lore Lesson. Enjoy! So we hear you like to make gold, well it's time we share some good gold making methods with you! Welcome back to another episode of Loreseekers. This week on the show we cover the latest details on the upcoming Guild Trader UI and Zone Guide, bring back ESO 101 with How to make gold in ESO, talk free crowns and more! Grab an ale and enjoy the show! Say it isn't so!!!!! This week on Loreseekers we pay tribute to Lawrence Schick as he departs ZOS, prepare you for the Morrowind Celebration Event and talk February's Crown Store Showcase in the news, complete a Lore Lesson on Elsweyr and much more. Grab a drink and prop up your feet - it's showtime! Greetings friends! Welcome back to the Loreseekers Podcast! This week on the show Kash and Jibbs go over the latest info on Depths of Malatar, do an in depth analysis on racial passive changes, complete a Lore Lesson on the Alfiq/Senche-Raht, answer your emails and more! Enjoy the show! WE'RE BACK!! This week on the podcast Kash and Jibbs talk about their trip San Francisco for the reveal stream, all the information surrounding Elsweyr and they polish it all off with a tall glass of dragons in a new Lore Lesson! Grab a drink, prop up your feet and enjoy the show! Hey friends! This week Kash and Jibbs traveled to California for the unveiling of Elsweyr! While we couldn't put together a full show like normal we thought you would enjoy listening to the post show that Jibbs was on! Enjoy the show and prepare yourself for a MASSIVE Loreseeker episode next week, as the guys cover all the info from the release and much more. The announcement of a new era of Elder Scrolls Online approaches and we're here to cover it! Welcome back friends to another episode of Loreseekers! This week on the show we go over the MASSIVE amount of teaser information on the next ESO expansion (no datamines, official posts only), talk ESO winning more awards, the return of Midyear Mayhem and polish it off with a cold glass of Abnur Tharn in a new Lore Lesson...oh and Dragon Breaks. It's time we understand them. Grab a drink, pull up a seat and enjoy the show at the tavern! LS Vol. 3 #8: New Year! Happy New Year! We're back at Loreseekers with the first episode of 2019! This week on the show Kash and Jibbs catch up from the holidays, talk new things happening at Loreseekers, dive into the Lore of the Mundus Stone in a new Lore Lesson and cover all the news for TESO including: Evolving Indriks, Summerset winning awards, Midyear Mayhem returning, Crown Store showcase and much much more. Thank you for listening and as always enjoy the show! Christmas is coming early with an early episode release! Like we stated on the previous episode we wanted to do something special for our listeners, something we originally said we were unsure if we'd ever do..well..here we are! Enjoy the live and uncut episode of the Loreseekers. In this After Dark edition of Loreseekers we take a look at listener questions and topics including a centralized auction house (revisited), further incorporating the RPG element of the mmorpg into ESO to already established systems, housing limitations, quality of life changes we'd like to see, Daedric creations and much more. We hope you enjoy this very special episode of Loreseekers. Merry Christmas and see you in 2019! FUS RO DAH!!! Welcome back Seekers! This week on the show we cover the latest news surrounding the New Life Festival, unveil a VERY special Loreseeker event coming 12/19 and we take a step into the colds of Skyrim and learn about the lands of the region. Prop up your feet, order a drink and enjoy the show! Tamriel's full of knowledge, interesting characters and most importantly..unique artifacts! Welcome back friends to another episode of Loreseekers. This week on the show we chill out and talk around the tavern table about a brand new Crown Crate season, the December Crown Store showcase, tell you how you can play ESO for free, answer fan mail and complete a Lore Lesson on Tamriel's interesting artifacts! Grab a drink, grab a seat..welcome to the tavern friend. We're back! This week Kash and Jibbs talk about the Undaunted Celebration Event, tell you how you can earn a free pet in December, complete a Lore Lesson on the forgotten races of Tamriel and much more! Grab a drink, prop up your feet and enjoy the show! Happy Thanksgiving from the Loreseekers! This week on the show we bring back Zone Chat with your Twitter responses, meet a "furry" friend once again, tease an upcoming special recording, learn about Vivec in a new Lore Lesson and answer your fan mail! Enjoy the show! Oh....and...mind the sand....it's everywhere. What happens to your character if they receive racial passive changes? How was Clockwork City built and how does it work? We answer all of this and more on this week's episode of Loreseekers! Not to mention we cover your emails and receive a new submission from the Mission Board. Enjoy the show and don't forget to subscribe to get your episodes automatically! Just in time for the Clockwork Celebration event, this week on the show we complete a Lore Lesson on Sotha Sil, prepare you for the upcoming ESO Plus event, talk ESO Live, answer fan mail and debut our first fan written RP story event from the Mission Board. Grab a drink and enjoy the show! LS Vol. 3 #1: Is ESO Canon? Welcome again Seekers to the Loreseekers podcast! This week we celebrate the launch of Volume 3 with details of what you can expect this volume, prepare you for our Extra Life stream, talk Update 20 housing features, cover the November Crown Store showcase and ask the question in our Lore Lesson...is ESO canon? We are so happy to have you back with us. Enjoy the show! Hello Seekers, welcome to the official Lore Lesson compilation from Volume 2! We can't thank you enough for your continued support and listenership. Below you'll find the time stamps to help you easier navigate through the massive episode. Enjoy the lore and we look forward to seeing you in Volume 3! LS Vol. 2 #14: Witches Festival! Hey Seekers! Welcome to the final episode of Volume 2! Today on the show we prepare you for the Witches Festival, complete a Lore Lesson on the haunting of Glenumbra/Witches Festival, discuss Volume 3 of Loreseekers and much more! 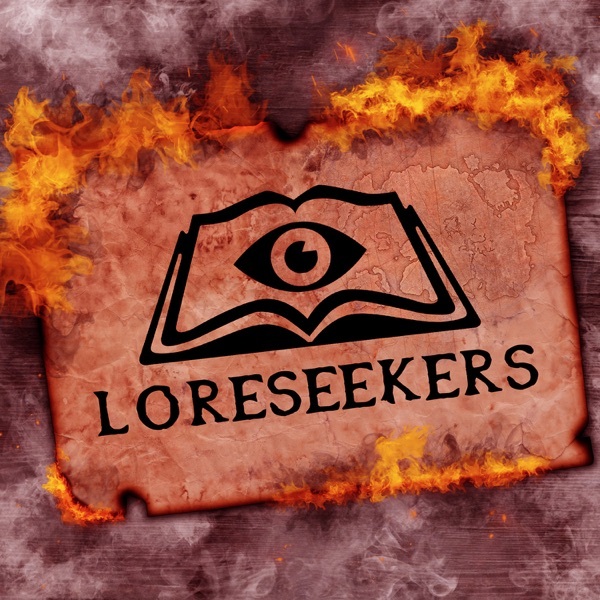 Want to join the official Loreseeker guild? Visit Loreseekerspodcast.com/guild to learn more! Grab a drink, prop up your feet and enjoy the show! Hey Seekers! Welcome back to another episode of Loreseekers! This week on the show we discuss Murkmire release dates, talk dates for all ESO events through January, learn how we can earn a FREE Indrik mount, answer your fan mail and complete a Lore Lesson on the Keerilth vampire clan and how to become a vampire in ESO. Cozy up by the fire, grab a drink and enjoy the show! P.S. As always, thank you for listening. You're awesome! Lanterns lure and pumpkins trip. Webs ensnare and grave hands grip. Crows will mock as wraith-scythes hack. ALL IN THRALL OF HALLOWJACK! Welcome back friends to our first of three episodes dedicated to Frostfall! This week on the show all kinds of spooky fun is is taking place as we chatter about the Crown Store Showcase for October, and breakdown the Blackrose Prison preview. We also reveal a very special Lore Lesson on Vampyres and answer your mail! Enjoy the show! Welcome back Seekers! We're excited to bring you a new episode of Loreseekers! This week on the podcast we talk the latest news on Murkmire, debut a brand NEW segment that involves YOU, talk the Amulet of Kings in a new Lore Lesson, answer your fan mail and much more! Prop up your feet, grab a drink and enjoy the show! Hello Seekers! We are back with another episode of Loreseekers! This week on the show we discuss the Update 20/Murkmire preview, talk the future of ESO Plus and go over all the details for Summerfall! We also answer your mail and complete a Lore Lesson on the Black Marsh! Grab a drink, prop up your feet and enjoy the show! Hey Seekers! Welcome to another episode of Loreseekers. This week on the show we talk all the latest news surrounding Elder Scrolls Online, discuss the top three things we want added by the next major expansion, talk City of Ash in Dungeons 4 Dummies, discuss the holidays of Tamriel in a Lore Lesson and much more! Grab a drink, prop up your feet and enjoy the show! Hey Seekers! Welcome back to another episode of Loreseekers! This week on the show we go over Murkmire news from Bethesda Gameplay Days, talk Crown Store Showcase for September, go over the Imperial City Celebration Event, bring back Dungeons 4 Dummies and finish the episode off with a Lore Lesson on the Heart of Lorkhan. Enjoy the show and don't forget you can email us your questions at Loreseekerspodcast@gmail.com or call us at 765-382-6961. Welcome back traveler! Loreseekers is back with a brand new episode and this week we cover the latest news surrounding the Bethesda Gameplay Days event, September Daily Login Rewards, answer your mail and finish the episode with a special Lore Lesson! Did you know it's the 25th Lore Lesson for the show? We're so excited and hope you enjoy it! Lets talk Fighters Guild! This week on Loreseekers we go over highlights from the latest patch notes and debut a brand new segment that we call Dungeons 4 Dummies! In the D4D series we'll be going over various dungeons from top-to-bottom, educating you on difficult boss fights, what sets drop from each dungeon and all the other details surrounding the four person content. We also complete a Lore Lesson on the Fighters Guild! Prop up your feet friend and grab a drink, it's time for Loreseekers! aaaaAAAARUUUUUUuuuuuu! The howl of werewolves fills the air this week at Loreseekers as we celebrate the launch of the Wolfhunter DLC! On today's show we do a complete wrap-up on the Quakecon Keynote, talk the incredible stats from this year's Midyear Mayhem, discuss our first impressions of Wolfhunter, complete a Lore Lesson on the Storyline of ESO (don't worry - NO SPOILERS) and answer your questions from the mail courier! Prop up your feet at the fire friend and enjoy the show! Guard your pockets! It's Thieves Guild week here at Loreseekers. Today we cover all the news surrounding the Wolf Hunter Keep dungeon from the upcoming Wolfhunter DLC, details on the new battleground map Istirus Outpost, Crowns and ESO are on sale, upcoming outfit styles in Update 19, prelude to ESO at Quakecon and we finish it all off with a Lore Lesson on the Thieves Guild! Grab and drink by the fire friend, welcome again to the show! Welcome back listeners to another episode of Loreseekers! This week on the show we announce a brand new award, talk Wolfhunter release dates, go over the LARGE Crown Store Showcase for August, answer your emails and talk the Ayleids in a new Lore Lesson! Grab a drink, prop up your feet and enjoy the show! Hey travelers! Welcome back to Volume 2 of Loreseekers! Today on the show we are covering a MASSIVE amount of news including all the details surrounding the Midyear Mayhem PvP event, the respec 2.0 system, Werewolf skill lines, itemization changes, Templar updates, Ilambris style packs and much more. We also do a Lore Lesson on the Imperials(yep, you read that right) and answer your emails! Have a seat, take a drink and enjoy the show! Welcome back adventurers, today we are proud to release to you the Volume Two of Loreseekers! This week on the show we discuss the upcoming DLC Wolfhunter as we breakdown the March of Sacrifices dungeon, talk changes coming in Update 18, bring back our Lore Lesson series with Necromancy and much more! Welcome back friends, enjoy the show! The Loreseekers Podcast has introduced "Volumes" to our series! Our podcast isn't just about Elder Scrolls Online news and lore, now we have a storyline that the listener can follow and enjoy. If you are part of our in-game guild , these storylines will be presented to you as guild events where you all take part in the story! To get you all caught up to what has taken place in Volume 1: The Tavern, here is a short audio clip for you to enjoy! Welcome dear friends to this very special edition of Loreseekers! This week we have prepared over seven hours of Lore Lessons from Volume One of the Loreseekers Podcast! Below you will find time stamps the Lore Lessons so you can go right to the one you want to hear! Thanks for your support, kind words and most importantly your listenership. Enjoy! Welcome back to another episode of Loreseekers! This week we talk the future of the show, discuss the power of sound in the Elder Scrolls Online and talk Orcs in a new installment of our Lore Lesson series! Prop up your feet, order a drink and enjoy the show! Phew, it's a hot one this week! Welcome back to Loreseekers as we're hanging out in Argonia! This week on the show we discuss trading Crown Store items for gold, what we got in the Psijic Crown Crate giveaway, talk Argonian lore in our Lore Lesson series and answer your emails! Prop up your feet, order a drink, NOT HIST SAP, and enjoy the show! We. Are. Back. Welcome again to another episode of the Loreseekers podcast! This week on the show we cover all E3 news surrounding Elder Scrolls Online, answer your emails, talk Battlegrounds in ESO 101 and continue our Lore Lesson series with the Werewolves and Hircine! Enjoy the show! ...Oh, we also tease part of what's to come for the future of Loreseekers. Back we are Patrons! Welcome to episode 15 of the Loreseekers podcast. (hey, we're almost to 20!) This week on the show we cover the Crown Store Showcase and Crown Store Daily Rewards for June, continue our Lore Lesson series with a deeper look at the Daedric Prince Mephala, talk our new look and much more! Kick up your feet, order a drink and enjoy the show! Welcome back patrons! We're back with a brand new episode of Loreseekers. This week on the show we talk the latest news surrounding Bethesda, have a discussion on features in the next expansion, we bring back our ESO 101 segment with addons and talk the Sea Sload in a new Lore Lesson! Order a drink, prop up your feet and enjoy the show! Anchors Aweigh! Welcome to this very special episode of the Loreseekers podcast. Summerset has launched for PC and we're here to give you our first impressions, highlight the Summerset patch notes, reveal a surprise Summerset Lore Lesson and much more. Order a drink, kick up your feet and enjoy the show! Welcome back patrons to another episode of Loreseekers! This week at the tavern we're preparing you for Summerset as we cover the latest news, meet the organizations of Summerset, learn more about what we can expect to experience on the Isle and continue our Lore Lesson series with the Dark Brotherhood! Pull up a seat, order a drink and enjoy the show! MURDER! MURDER I SAY! Welcome to this special episode of the Loreseekers podcast. This week on the show we talk the latest news, continue our Lore Lesson series with the Khajiit, answer your mail and a murder is committed in the tavern! Oh, and before we forget...Snow Elves! Be sure to listen to the end of the episode! Broadcasting from our own tavern in Tamriel, welcome back to a new episode of Loreseekers! This week we celebrate ten episodes while covering the latest news, teach you the housing system in ESO 101 and continue our Lore Lesson series with the Redguard. Prop up your feet and enjoy the show! Hey everyone! Loreseekers is back again with a new episode! This week on the show we cover the latest TESO news, break down the Champion Level system in our ESO 101 segment, talk the Bretons in our Lore Lesson series and reveal a very special announcement! Enjoy the episode and thank you again for listening and for your support! Welcome back patrons, the tavern is open! This week on Loreseekers we break down the large info dump on Jewelry crafting, go over the latest ESO livestream, continue our Lore Lesson series with the Nords and answer your voicemails! Prop up your feet and enjoy the show! The tavern is open and the bards are ready, welcome to another episode of Loreseekers! This week on the show we go over the changes coming to available ESO editions, have a discussion on the PAX East Gameplay Day livestream, bring back ESO 101 with Dungeon etiquette and continue our Lore Lesson series with the Wood Elves! Pull you a chair to the table and prop up your feet, let's talk ESO! Welcome back to the tavern patrons, Loreseekers is back with a new episode! This week on the show we go over all the news for TESO including details on Update 18, the Anniversary event and the April Crown Store Showcase. We also dig through all the information surrounding Summerset after the NDA lift including jewelry crafting traits, armor set changes, the Psijic Skill Line and much more. Oh, and your favorite is back...a Lore Lesson on the Psijic Order! Prop your feet up with a drink and enjoy the show! The tavern is open! The Summerset edition of Loreseekers has arrived. This week on the show we cover all the information for the Summerset expansion, continue our Lore Lesson series with a complete history of the Summerset Isles, answer your voicemails and much more. Thanks for tuning in and enjoy the episode! The tavern is open, the bards are ready, episode four of the Loreseekers podcast is here! This week on the show we go over the latest Elder Scrolls Online news, talk skyshards and weapon slotting in our ESO 101 segment, continue our Lore Lesson series with the Dunmer and answer your emails! Enjoy the episode and thank you again to the wonderful ESO community for your continued support of Loreseekers! Host note: Next week will be a HUGE episode for us as we'll be covering the Summerset expansion. Get ready, its gonna be awesome! The tavern doors are open! Welcome back to another episode of Loreseekers. This week on the podcast the news was low, but the discussions were heavy. This week on the podcast we cover how your real life relates to your ESO play, introduce you to crafting in our ESO 101 segment and talk our first racial motif-the High Elves! Welcome back patrons to the Loreseekers podcast! This week in episode two we cover the large amount of news surrounding ESO, introduce the brand new "ESO 101" segment, discuss what the Elder Scrolls actually are and how they work, answer fan mail from the mail courier and much much more. Enjoy the show! Hello fellow patrons! Welcome to the very first episode of the Loreseekers podcast! We are very excited to finally reveal the podcast to everyone and hope you enjoy your stay with us at the Unknown Tavern in Tamriel! On today's episode, we introduce ourselves to the masses, tell you what you can expect from the Loreseekers podcast, talk the latest Elder Scrolls Online news, introduce our first Lore Lesson and much more! Welcome again and enjoy the podcast! Hey everyone! Jibbs and Kash here from the Loreseekers podcast for Elder Scrolls Online. We can't wait to bring you guys a brand new, high quality podcast for the ESO community. See you all this Friday!